There was a birthday fiesta in the air and I had some bread rolls to make and take. I had been given some cream horn moulds from a friend and along with lots of planned pastry goodies, I also wanted to make some bread rolls. I did a trial run and they seemed to work well. The Monkeys had inhaled them, so I thought they would be good enough to take to the birthday fiesta planned for the weekend. First up, make some dough. I used the very versatile olive oil bread recipe. 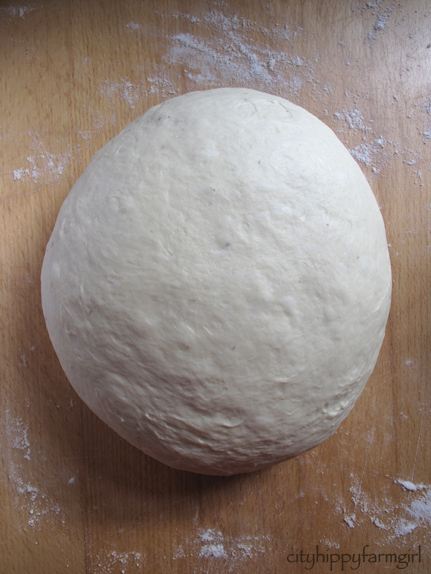 When it comes to the shaping stage, divide the dough into even pieces, (approx 1/16 with this amount of dough, with a little left over- I made 17 cone rolls). Roll them into skinny lengths. Making sure all the bubbles are out. 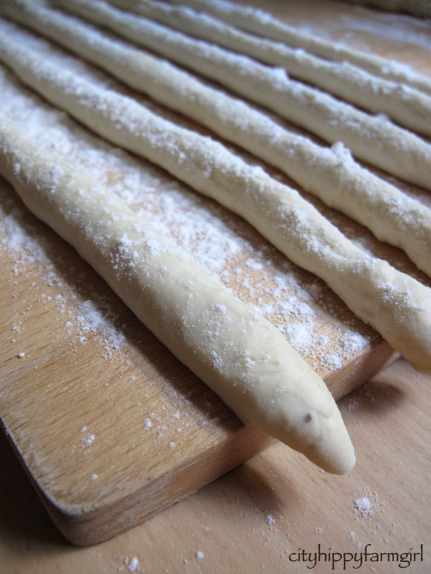 Roll them on an unfloured surface, you want a bit of stick to be able to roll properly. 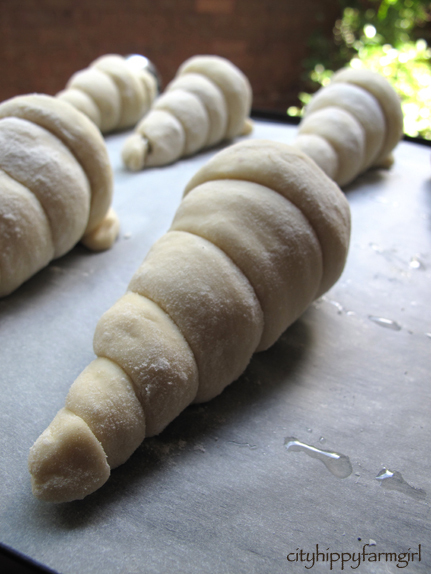 Once they are rolled them dust them with a little flour, you want them to keep the rolled shape, when proving. Lightly oil your cone moulds and then roll the dough along the mould. I found it was easier to keep on the bench rather than holding it up and winding it round. 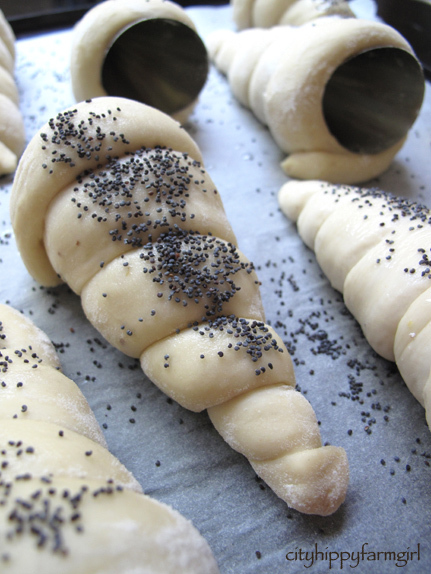 Plain ones are easy or using a little oil and then a light dusting of poppy seeds. Bake in oven at 240C with steam, for approximately 15 minutes. Oven time is going to vary, I would start watching them like a hawk from the ten minute mark. Stuff them full of anything that takes your fancy. We had these with beans, chicken, guacamole and sour cream, (or as The Monkeys and their Monkey Cousins did, stuff a sausage in there so as not to cut in on any essential play time. 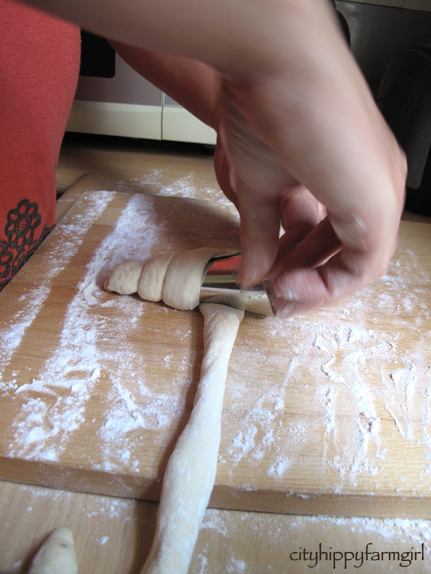 Tips * When winding them up, don’t let the dough go over the lip of the cone mould, the bread will bake over and be difficult to get out. When taking the mould out, do it while the bread is still warm. This post submitted to the wonderful holiday version of yeastspotting. 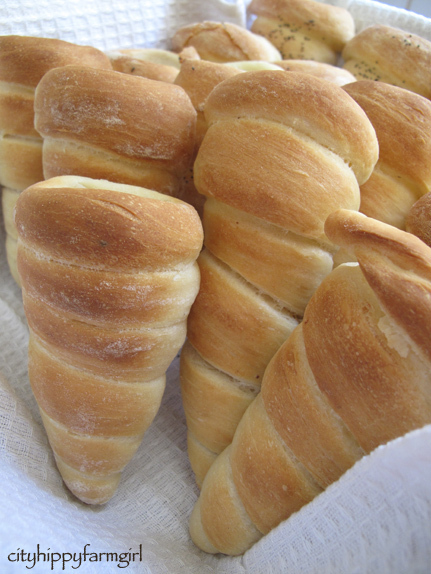 This entry was posted in Baking Bread and tagged bread cones, bread rolls, celebration bread, easy, fiesta, food, holiday bread, olive oil bread by cityhippyfarmgirl. Bookmark the permalink. GREAT job, Brydie! What an unusual and very useful shape! Thanks for the tutorial.. They are a useful little shape. You could stuff these little fellas full of anything. Love the idea of stuffing them w a sausage, go monkeys! This is such a clever yummy idea. Only buying meat from farmers markets is making life a little tougher for me, especially when I am busy a few Satruday’s in a row so can’t get to one. I’m enjoying it though. I think I need to get a bit better at bulk buying when I am at a market. Although not having a car is a challenge. Bulk is my friend as well Richard. I say enjoy it while it’s there and plan to enjoy it when it’s not. If your little monkeys ever decide to go on junior masterchef; what a headstart they will have had with a mum like you. Your cones look splendid! Thanks for all the useful tips and the mind boggles with all the possibilities. I’m already thinking fruity bread with a citrus ricotta filling. Wonderful, wonderful stuff dear lady. Mmmm, fruity bread with ricotta citrus filling…yes indeed Mariana. As for The Monkeys, I have high hopes they will know how to cook, but you never know! I love these! I am making them as soon as I get home. I hope you do Debra, they were great little bread rolls. OH YUM they look fantastic! with cream and jam inside. Or for mopping up yummy casseroles. Really with anything. They look so good! They would be super versatile for a whole bunch of things. what a great and versatile idea brydie.. They really are versatile Jane, you could do a whole bundle of things with these little fellas. Now that’s just the cleverest thing I’ve seen in a long time. And beautiful, too. so gorgeous…what a fabulous idea!! Give them a crack Dmarie. Is it bad that I not only want these now, but a cannoli? Any time is a good time for cannoli Greg. They should be in any good cooking store C. I was super lucky that friend gave them to me. You think you could use an ice cream cone and pull it out after baking? Possibly Natalie, maybe if you oiled the cone before hand?? Otherwise it’s just going to get baked on there. What a clever idea, Brydie. I haven’t had any breakfast yet – I wonder if that was why the very first use that came to my mind was to stuff them full of hot chips to make a handy-dandy chip buttie (hot chip sandwich)?! Oh sweet mama, yes. A big fat yes! That would be awesome! Crikey, I am definitely going to have to see about that. Ohhh, you are so very talented. They look amazing. fantastic – they look great – I thought they were going to be the sort stuffed with sweet cream but how exciting to make them and stuff them with dinner – great entertaining idea because you have a little cone to hold your dinner in! A novelty for the kiddo’s too Johanna. Anything that encourages little people to run off while still eating dinner is alright by me! You are such a clever girl , Brydie. I want all your stuff in one big cookbook to keep on my kitchen bench. Just loved the look of the cones and just have to try it ( hopefully it will work with spelt flour) . Fantastic idea – you are so creative! It really comes down to the very flexible dough- you can use it for pretty much anything. These look amazing! Guacamole and sour cream – yum. Kind of vol-au-vent-like, but better because you know what’s in them. You are pretty limitless with what you could pop in here. There will definitely be a repeat. They look great. The sausage stuffing made me laugh … how Thai (they have all manner of breads and pizza crusts stuffed with sausage here 🙂 ) … if it was a vegetarian sausage I think I’d give it a go. Oooh, I remember seeing an advert in Malaysia for a sneaky sausage stuffed pizza crust. I thought that was pretty amazing at the time! Amazing and made with sour dough! No these little fellas are just the regular yeasted kind. 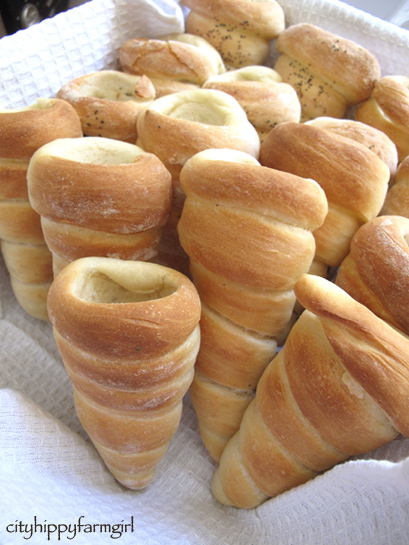 Hi, I baked a batch of this bread last weekend, but I only have 6 cone moulds, balance dough shape it to round. Can I wait till 1st batch of the bread done, than continues to use cone moulds to shape balance dough, will it affact the texture of the dough? if I want to substitue with wholemeal flour, how much to use?